Geronimo Pole Co. has a select quantity of high quality Japanese Tokobashira poles in our inventory. The traditional Japanese method for debarking utilizes a bamboo tool to carefully slough the bark from the pole in spring. This allows the true nature of the pole to be expressed, revealing a subtle beauty. 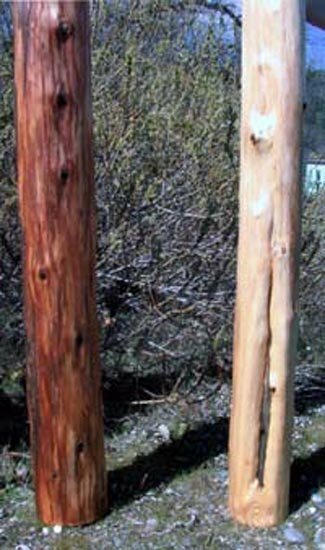 The quality and fineness of these poles is exquisite revealing color, luster grain and most importantly naturalness. This specialty product is seasoned indoors over time to produce a finely crafted pole highlighted in traditional Japanese homes, temples and teahouses. However the majority of these poles are sold to builders of fine crafted American custom homes. The Tokobashira or ornamental alcove post is procured from the following varieties of trees: Incense Cedar, Pine, Oak, Manzanita, Yew and Black Locust. Some specimens will be clear (without knots) while other will have a polished smooth finish of gentle light and dark colors with gnarls and branches neatly spaced. Commonly requested these are called Muro in Japanese while the other style is called Shibori Maurta. Aesthetically fascinating they resonate not only with the sound of the wind in the cedars but also with the intrigue of primal forces. Tokobashira poles range in diameter from 2 inches on up to 16 inches. More common requests range from 4 to 7 inches. Lengths are available up to 35 feet. Subject to stock on hand. Quantity discounts are offered, Please call for pricing and availability. Tokobashira shelves are procured from a select quantity of smaller width slabs. On some shelves one side is flat and the other is kept naturally round from the log cut. This natural face will often have character knots and wane.